By Daniel Horowitz—This Monday, November 19th, join thousands of Torontonians who will come together in a show of support for the people of Israel as they continue to be brutally targeted by countless Hamas Rocket Attacks fired from Gaza. Hear from noted speakers and direct first-hand reports from the confrontation zone describing the current situation in Southern Israel and what tomorrow may hold. 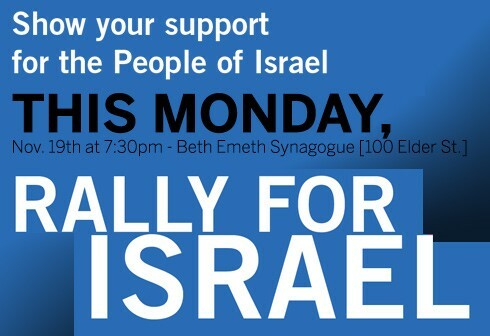 The Rally will be held 7:30 p.m. at Toronto’s Beth Emeth Bais Yehuda Synagogue, (100 Elder Street). For those who can’t attend in person, there will be a Satellite Rally broadcast live at UJA Federation’s Schwartz/Reisman Centre on the Joseph & Wolf Lebovic Jewish Community Campus in Vaughan, and another at Wolfond Centre for Jewish Campus Life (36 Harbord Street). Don’t miss this chance to stand shoulder to shoulder with our community on behalf of Israel.